Johnson-Thompson & Ennis-Hill: What makes a perfect heptathlete? To master anything requires practice and dedication; to excel in multiple events needs round-the-clock devotion. Few have the talent; fewer still possess such single-minded commitment. The multi-skilled individual is a special breed. That is why the heptathlete is not a jack of all trades. They are athletes with world-class ability in a number of disciplines - sprinting, throwing and jumping to a standard that rivals the specialists. 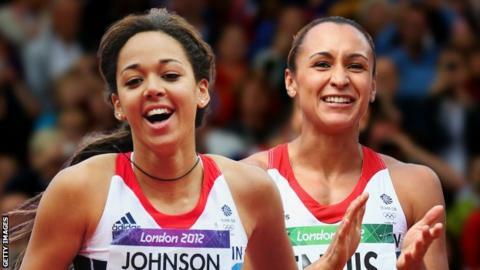 With British heptathletes Jessica Ennis-Hill and Katarina Johnson-Thompson in World Championship action in Beijing, we talk to Ennis-Hill's coach Toni Minichiello, former Olympic heptathlon champion Denise Lewis and Mike Holmes, the coach of Johnson-Thompson, to find out what makes the perfect heptathlete. "The emotional toll can be huge. It can be quite a debilitating experience and I have known athletes to require weeks, even months, to recover fully." Mike Holmes. Even if all heptathletes were born equal, the great could still be separated from the good by one trait. The champions are the ones who can ride out adversity. They will not collapse like a souffle when a bar tumbles or a javelin strays out of bounds. They go again. And again. "Rarely, if ever, does an athlete execute the perfect heptathlon so resilience is necessary," says Holmes. And because of the demands of multi-discipline events, heptathletes will only complete full competitions once or twice a year, so the pressure to get it right is immense. The days, too, are long: early starts, late finishes; eating, competing, resting, fulfilling media commitments - all for a two-day competition which could, were all seven disciplines performed without pause, be done and dusted in three minutes or so. "You have to be the greatest individual you can be spread over two days and that's what takes it out of you," says Minichiello. "The three and a half minutes is physical; the 48 hours you go through is mental." Part of that mental strength is the preparedness to work hard, all the time. "You're talking six to seven hours of work a day," says Minichiello. "There's weight training sessions two or three times a week, and running sessions which not only cover speed but endurance too. "It's a grind. It's year-on-year development. It doesn't come instantly; it's nothing short of graft." The 29-year-old Olympic champion Ennis-Hill, a dainty 1.65m (5ft 5in) and 57kg (8st 13½lb), was too small to be world class, her coach was told early in her career. Johnson-Thompson, at 22, stands 1.83m (6ft 0in) tall and weighs 68kg (10st 10lb) - a stature far more common among current heptathletes. "What they couldn't see was the work ethic or the competitive nature of the individual," says Minichiello of the young Ennis-Hill. "That ability not to give up and keep improving." To soar through the air, to cover the track at lightning speed or to produce a bicep-popping throw? Which skill is the most important? Which will gain most points? The heptathlon is a speed and power event. Over two days, athletes compete in seven events - 100m hurdles, high jump, shot put, 200m, long jump, javelin and 800m. A heptathlete will receive points for her best performance in each. The athlete with the highest overall score wins. All the events are "crucial", says Minichiello. But a heptathlete who excels in the high jump and long jump will earn enough points to put them in contention for glory. Clearing 1.82m in the high jump will earn 1,000 points - the elite will easily go higher (Ennis-Hill's outdoor best is 1.95m, Johnson-Thompson's 1.90m). To collect 1,000 points in the shot, by contrast, requires a 17.07m throw, a mark not even Jackie Joyner-Kersee - an athlete Minichiello says was as close to perfection as there has been - could get close to. The American's best was 16m (928 points), and she threw 20cm below that when breaking the world record. Holmes, originally a throwing coach, says it takes time to develop consistency in the shot and javelin. "It's not until you're about 33 that you peak in the shot - that's why if you look at the development of Denise Lewis and Jessica Ennis-Hill, it's been very gradual," he says. "They got there in the end but it's not as rapid as the high jump, for example, when you peak at the age of 21 and 22." Denise Lewis came away from the Atlanta Olympics in 1996 with a bronze medal, but she wasn't satisfied. She moved to the Netherlands to link up with Charles van Commenee, who would later become Britain's head coach. Between them they concocted a four-year plan for Olympic gold. "During that time you can't really go into detail with all seven events," says Lewis. "Yes, you have the general conditioning throughout, but specifically you would need to target events per year to pull them up to standard." Lewis focused on the shot and javelin. She teamed up with an international shot putter, worked on her technique - increasing power and speed - and used video analysis. After 12 months of shot put drills three days a week, the Briton had improved. In 1995 her shot put best was 13.24m, but 12 months before the 2000 Olympics she hit a personal best 16.12m - a 193-point improvement. But a coach will "look at the animal they've got," says Minichiello. "With Jess we pushed more with the sprints, developed the jumps to a good level and had a good long look at her weaknesses, which were the throws. They were incredibly weak when she was young, and we worked hard to get those to a level where they were very competitive. "You're thinking: do I thrash that to get more points or not? If I wanted to throw the shot half a metre further, what is it going to take and will it be detrimental to other events? If I get 20 points out of four events I get 80, as opposed to thrashing one event to try to get 50 points." Understanding and trust between athlete and coach are essential to making those year-on-year improvements in different disciplines, as they are to excelling under pressure on the day. Lewis likens working with the right coach to "getting the right pair of shoes"; she talks of a relationship which must "feel good and comfortable". "The coach has to give you the right instruction at the right time and that's why it's so special," she says. "Imagine two no-jumps in the long jump. Whatever they say to you after the second no-jump is crucial. They have to be able to stay calm, be clinical in their instructions." Holmes adds: "When maximum effort is put in and something goes wrong, even the most experienced world-class heptathlete will suffer vast disappointment. "Points have been haemorrhaged and must be made up. The coach has the task of turning that around and moving things forward because there is another event coming up and that requires 100%." Mind games are not the preserve of Premier League football managers. Heptathletes have also been known to manipulate a rival's mind because the battle for multi-eventing supremacy does not begin on the track. Injured? Keep quiet. Worried? Say nothing. Lewis injured her Achilles tendon during a javelin competition in Birmingham in the summer of 2000, weeks before the Sydney Olympics for which she had made life-changing sacrifices. Her iffy heel stopped her from competing, stopped her from training, but her rivals could not find out. "Three weeks before competition I was in trainers, walking around the track - that's all I could do. I was pulling out of things left right and centre. I just didn't want people to know the extent of my injuries because I didn't want my competitors gaining strength," she recalls. "We all have the bravado. You have to choose your words carefully in the press conference. You don't want to give too much away about your physical state because you don't want awkward questions that are going to make you feel vulnerable. "It was a laborious two days, even away from competition, and that's why I'm so proud of my gold medal. It wasn't the best score but, to me, it was everything because I had to dig deep." Watch live coverage of the World Championships heptathlon on BBC Two, BBC Red Button and the BBC Sport website on Saturday, 22 August (events starting at 02:00 BST, 03:20, 11:30 & 13:15) and Sunday 23 August (02:00, 03:50/05:05, and 12:40).